Premium quality organic Fairtrade freeze-dried instant coffee. A blend of 100% Arabica highland coffee beans sourced from Papua New Guinea, Peru and Mexico, this coffee has a naturally smooth and rich flavour. It is grown 100% organically using only natural methods of cultivation. 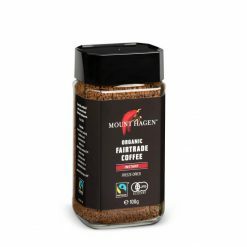 Mount Hagen is a leading global brand of organic coffee renowned for outstanding taste and quality as well as strong principles of caring for people and the environment. It takes its name from a place in Papua New Guinea, from where the company sources its coffee, as well as Peru and Mexico. To make the highest quality organic coffee, Mount Hagen invests in the land and the people. No chemical fertilisers or pesticides are used, and sustainable water management is ensured. The coffee cherries grow slowly at high altitude, allowing distinctive flavours to develop. Birds and bees thrive in the woodland gardens, resulting in fewer pests. Harvesting is by hand, as the coffee gardens are often located on steep slopes. Only ripe, red cherries are selected. Fermentation takes place very slowly under controlled conditions. The beans are then washed several times and dried for shipment to Hamburg, Germany. On arrival, they are gently roasted: a process that allows more than 800 complex flavours to develop and unwanted acidity to be degraded. After roasting, the beans are rapidly cooled to ensure the perfect condition is maintained, giving Mount Hagen coffee a wonderful bouquet. Based on sustainability and a fair partnership, the company has supported its cultivation partners in changing to organic farming. The smallholders have thereby improved their familiesEE living conditions through reliable acceptance of their crops at guaranteed prices, together with financial assistance.